On April 14, 1912, on her maiden voyage, the mighty Titanic sank in the cold Atlantic waters off the coast of Canada. In the many years since, the Titanic has been remembered in song, cinema and numerous books. You can build a model of this famous White Star ocean liner using simple materials. 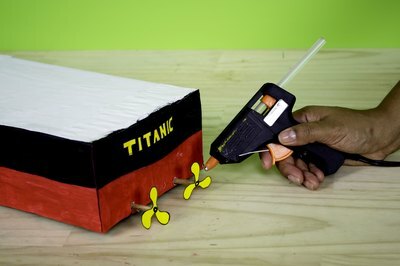 Making a paper model of the Titanic is a great project for school or personal enjoyment. This model takes advantage of shoeboxes to create a three-dimensional base.Some models are extremely detailed and museum quality. Turn three shoeboxes upside down with the flat bottoms facing up. Set them together end to end to make a long rectangular shape. Staple or glue the shoeboxes together. This is the main body of the ship. 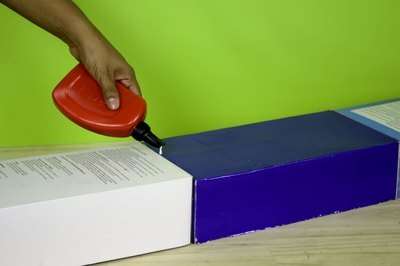 Glue white paper to the entire form of your rectangular shoebox base, concealing the sections where it is joined together. Let the base dry. Measure across each long side of the rectangular base and draw a penciled line. Measure each short end of the base and draw a penciled line halfway up the hull. Paint the bottom half red and the top half black. Cut a sheet of card stock to be the same height as the painted shoebox base. 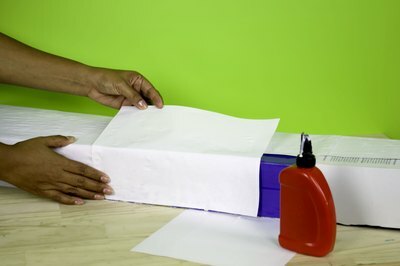 To make the prow, or nose of the ship, fold the sheet of card stock in half and pinch the fold. 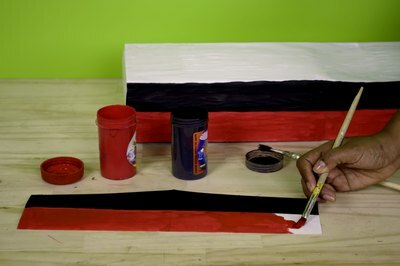 Hold it against the base to determine where the black and red paint should match up. Paint the folded card stock red on the bottom and black on top to match the base. Let paint dry. Glue the painted card stock prow to the front of the base, with the folded point curving out. Cut a rounded shape of red construction paper and staple to the bottom of the prow. Cut a similar shape of white paper and connect the top of the prow to the shoebox base. 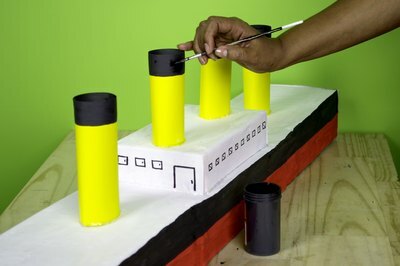 Make two propellers out of three petal-shaped pieces of yellow construction paper and glue onto the back of the ship. Cut a piece of black construction paper into a thin strip the same width as the black base. Paint "TITANIC" in yellow in the center. 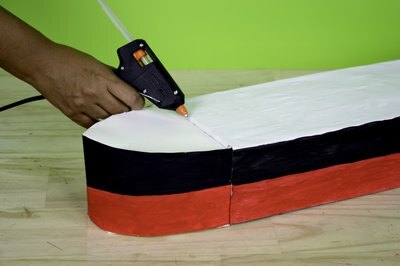 Glue the rounded black paper strip to the back of the ship as the stern. Cut the sides of the fourth shoebox to the height of 2 inches. Turn it upside down, with the bottom facing up. Paint white or cover in white paper. Glue to the center of the ship base as the upper decks. Paint small black rectangular marks all the way around the deck as the windows. For the smokestacks, cut a piece of yellow construction paper into four rectangles. Paint the top of each rectangle black. Roll each rectangle into a tube and staple or glue the ends. Let dry. Spread a thin line of glue onto the yellow bottom of each tube and glue along the top of the white deck shoebox. Decorate the top of the ship, using photographs for reference. Add as many finishing touches as you'd like. Make tiny lifeboats out of white clay, let dry, and add to the sides. Add a wooden dowel to the front and string fishing line as rigging. Paint gold windows along the upper black sides. Your ship can be as detailed as you want. Use reference photographs of Titanic to add detail to the top decks. It can be as decorated as you wish. Consult photos to get the pointed shape of the prow correct. This model is not to scale, but is intended as a school project or for personal enjoyment.